Sand and luxury brands might be the first things that come to mind when considering Dubai. The desert oasis has plenty of both - what with a vast expanse of arid surroundings and the largest mall in the world. Many come to Dubai to experience Arab culture and pick up the latest from Louis Vuitton or Chanel. Okay, it was not at the top of Scott's list of things to do, but I was keen on the surreal idea and knew we'd be interested in something to do because, well, there isn't a whole lot in Dubai. After a trip to a local fort/museum, the souks for gold and spices and a few other hot spots, tourists are left with only a gluttony of shopping destinations. And while I enjoy a stroll through a mall, I do not shop for sport like some women. So. Ski Dubai. It was on my list of things to do. And oh, did we do it. 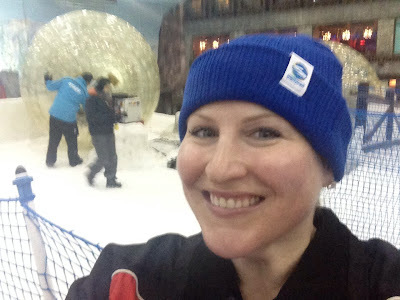 Fate tangled with us during this outing; the chair lift at Ski Dubai was disabled for annual maintenance, so we weighed our options: We could do skiing -or- the snow park (which includes a tubing run, the "Mountain Thriller" ice luge, and the huge human hamster ball aka Zorb Ball). I was disappointed by the chair lift closure because I didn't want to start with a black diamond run, which is also served by a secondary rope pull. I'd hoped to warm up my skiing skills with a blue run before hitting black. Management worked with us on pricing to allow both skiing and the snow park since the lift was closed - around $90 per person, including boots, snow pants and jacket, gloves and ski/pole rental. The hat in the pic below set me back about seven bucks. Dubai in mid-May is hot and steamy, and dozens of hyper school children had decided to swarm Ski Dubai and its frigid temps on the same day. We queued with the little kids to enjoy the ice luge and tubing runs. Kids of any nationality are apparently notorious for cutting in line. Seeking refuge from little voices and lots of pushing, we decided to head toward the grown up-only Zorb Ball, a rolling, rumbling sphere that spins like a washing machine. Next up in the Zorb Ball! The video below shows you what it's like to be inside the washing machine. Mind you, it is very jerky because it was shot while I was rolling down a hill inside a plastic ball. and the one from the desert safari confirm it. It was time to move on to the next chilly excursion after the Zorb Ball. 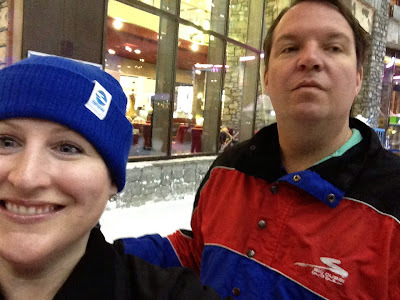 I'd planned on skiing and Scott was scheduled for a one-on-one personal encounter with a real live penguin. Outfitted with some nice, tight Rossignols I headed toward the rope pull. It was not my finest moment. After letting the Europeans go ahead of me, the attendant gave me a :30 second primer on how to ride the pole with a disk. Imagine having a frisbee attached to half a stripper pole, and putting said stripper pole/disc contraption between your legs, allowing said disc to pull your bum up a hill. If it sounds complicated, that's because it is. Slowly, I managed to glide up the hill, clinging to stripper pole/disc contraption and my two ski poles. I safely made it to the point when the hill became almost vertical in grade. And that's when I bit the dust and dropped to the icy snow pack. A ski patrol assistant whooshed down to help me up. With no contraption to grab on to, she instructed me to ski down. What?! "But I don't want to ski down the black diamond!" I simultaneously whined and whimpered. Tough, she said. This is the only way down, and there's no way up. I took a big gulp of the lump in my throat and assessed my strategy. This was not a time to lose control; I still had seven days of vacation to enjoy and didn't want to traipse through Bangkok on crutches. Knowing I stood a better chance of going slow and steady across the run as opposed to down it, I pushed off, my Christmas tree-triangle form firmly cutting through icy snow. A few nail biting minutes later, I was on the other side of the run, glancing up the hill and wondering about my next move. And then the Arabs started whirling downhill. Skiing in the Middle East is a novelty, and many UAE natives don't know the mechanics of this wintry sport. I was glad to be in their company, but knew we both lacked control of this snowy sport. My quick math made it easy for me: I could try going down the rest of the Black Diamond, and I could try my best to do it safely, but I had no idea whether my fellow skiers would be able to do the same. I snapped off the skis and decided to walk the rest of the way down. 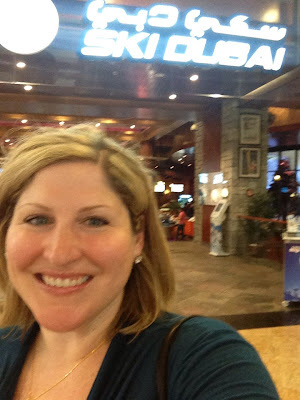 So technically I did a black diamond in Dubai, but let's keep the rest of the details between you and me, mkay?